Toyota Stadium was built by the city of Toyota in celebration of the city’s 50th anniversary. Construction started in 1997 and was completed four years later. Toyota Stadium officially opened on the 21st of July 2001. The first match between Nagoya Grampus and Jubilo Iwata was played one day later. The stadium applied to become a playing venue of the 2002 World Cup, but its application got rejected. Toyota Stadium has a retractable roof, which takes about 50 minutes to open or close. The roof is suspended by wire from four tall masts. The stadium has been a playing venue at every of the five FIFA Club World Cup tournaments that have been held in Japan in the last decade. It will also be one of the two playing venues of the 2012 FIFA Club World Cup. 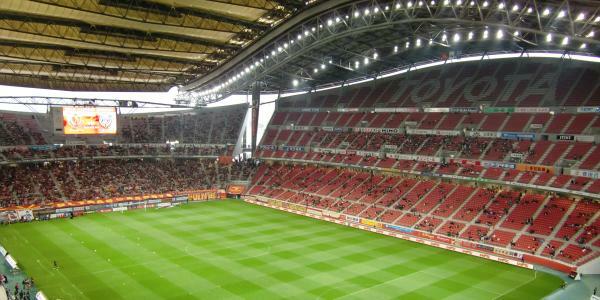 Toyota Stadium is located in the city of Toyota, which lies about 25 kilometres east of the larger city of Nagoya. Toyota is famed for housing the main plant as well as headquarters of the Toyota Motor Corporation. The stadium is situated just east of central Toyota at about 15 minutes walking from Meitetsu Toyotashi Station. Toyotashi Station is on the continuation of the Tsurumai (blue) metro line. The Tsurumai line can be boarded in central Nagoya (e.g. stop Fushimi), or can be reached from Nagoya Station with the yellow or red metro line. Allow at least 75 minutes for the complete journey from Nagoya Station. Toyotashi stadium can also be reached by trains on the Meitetsu Toyota line, which can, among others, be boarded in Chirya Station. Chirya Station can in turn be reached from Meitetsu Shin-Nagoya Station (located almost adjacent to Nagoya Station). Toyota Stadium is also at walking distance from Shin-Toyota Station (app. 17 minutes), which is on the Aichi Loop line. The Aichi Loop railway has several connections with other train lines. Tickets for Nagoya Grampus matches can be bought online, at the 7-Eleven, FamilyMart, Lawson, and CircleK convenience stores, through the PIA ticket agencies, or through the Internet and telephone sales channels that the above stores and agencies offer. Tickets can also be bought on the gate on the day of the match. Nagoya Grampus rarely sell out. Ticket prices typically start at Y$2,700 for the seats behind the goal and range up to Y$7,000 for a central lower-tier seat at the main stand. Nagoya Grampus play only part of their home matches at Toyota Stadium. The others are played at the smaller Mizuho Athletics Stadium in Nagoya proper. For more information call +81 (0) 52 242 9190. Nagoya-grampus.jp – Official website of Nagoya Grampus. Toyota-stadium.co.jp – Official website of Toyota Stadium. Kotsu.city.nagoya.jp – Information on the Nagoya metro.